Could the JWT CEO Scandal Become a Watershed Moment for Change? Unlike 4A's conferences in recent memory, soul-searching was the underlying theme in Miami this year—mostly the result of the fallout from the case against former J. Walter Thompson CEO Gustavo Martinez over alleged sexism and racism. Panel sessions and keynotes hit on the lack of diversity (and, to a lesser degree, transparency) in the ad business. It remains to be seen if the industry can live up to the conference's name: Transformation. Nancy Hill, 4A's president, kicked off the conference with an admonishment in light of the JWT scandal. "Unfortunately, the alleged behavior happens more frequently than we think," Hill warned the 750 or so in attendance. "Real change has to start at the top. That means if you are the CEO, you are the chief diversity officer. That means you need to look at every hire as an opportunity to change the playing field at your own company. Look at salaries. Is there a gap? If so, I urge you to fix it." 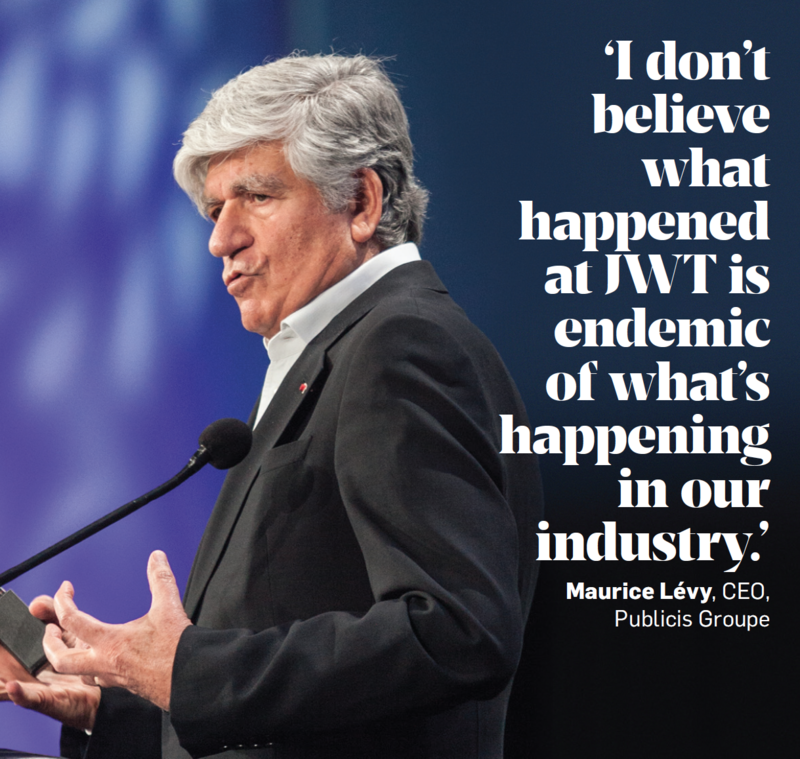 Martin Sorrell, CEO of JWT parent WPP, had a strong response to Lévy's comments. "I disagree violently with what Maurice said about it being a one-off," said the executive via video. "Maurice has a habit of ignoring the facts. … When we get to senior levels of management, the number of women drops, unacceptably, to a third" of all executives. Others voiced more hopeful and proactive opinions. DDB North America CEO Wendy Clark said the conference could help spur changes in the industry. "Fundamentally, we have to pull back the curtain on this discussion and as an industry use confabs like this to share our best thinking and best ideas," Clark, who recently joined the agency world after years with Coca-Cola, told Adweek. "Only by bringing this to the forefront and having these discussions can we remedy this [problem]. You can't pretend that it doesn't exist. That doesn't solve anything." The conference also highlighted efforts to fight sexism in advertising. Madonna Badger, co-founder and chief creative officer of Badger & Winters, spoke about #WomenNotObjects, her effort to combat ads that objectify women. "We need to make a decision to not only respect women, but also be in sync with their brand values," she argued. "Women buy somewhere between 70 and 80 percent of consumer goods in this country, so objectifying women and promoting an idea that how you look is more important than who you are isn't a smart business decision." Will all this talk lead to change? Hill certainly hopes so. "Typically, if you look at whistleblower situations in any industry, when somebody blows the whistle, other people blow the whistle," she said. "I'm not saying that this is a rampant problem, but chances are, somebody somewhere else will see this happening and say, 'It's time for me to speak up, too.' The level of discussion has ratcheted up, and I think we should consider this one of those watershed moments where we take a hard look at ourselves." Other issues addressed at 4A's included transparency and ad blocking. During his talk, Sorrell insisted that rebates—kickbacks from media outlets in exchange for buying ads in volume—don't happen at U.S. agencies, at least not at WPP shops. "We've made clear to the ANA that we're willing to talk to any client that has a concern [about rebates]," Sorrell said. On ad blocking, Donnie Williams, chief digital officer at Horizon Media, estimated that the industry could lose $20 billion in revenue because of the practice. "The end goal is better user experience," he said, "not because we want to create more revenue, but we want to create more powerful advertising." Added Rob Norman, chief digital officer of GroupM: "If we publish content of real value, people won't block it." This story appears in the March 28 issue of Adweek magazine. Click here to subscribe.